Whether it’s a beef or tofu burger that you toss on the grill to celebrate long light lazy days, nothing says summer more perfectly than BBQing by the lake. It’s something we like to think we’ve perfected here in Whistler. It seems like every couple of days I get a message from some friends to meet them down at the lake for a cookout. From the Village you really can’t go far in any direction without ending up in an amazing park that’s perfect for a family BBQ. A quick stop at one of our many grocery stores and you’re armed to grill up a storm. If you ask most locals about their favourite place to BBQ with friends they’re going to say Lost Lake. It’s the kind of place you head to if you’re looking to relax. Looking out from the sandy beach over the blue-green glassy water it can be hard to believe how close you are to the Village. (That’s what the naturists like about it.) It’s an easy 30 minute walk on a well-maintained gravel path to the park. And believe me it’s a leisurely 30 mins – you’ll rarely find someone in a rush here. The park has a great setup for a family BBQ. Its wide-open green spaces are perfect tossing around a Frisbee (“flying disc” if you’re a purist), and the picnic tables even have built in BBQ stands. Want to save your energy and go all out on the miles of hiking trails? No worries. Skip the walk in, and hop on the shuttle bus that leaves the village every 15 minutes from 10am till 6pm. Heading out a little farther from the Village you could make your way to Rainbow Park. Rainbow is our Cadillac of parks. It’s got all the extras to keep you happy and comfortable. 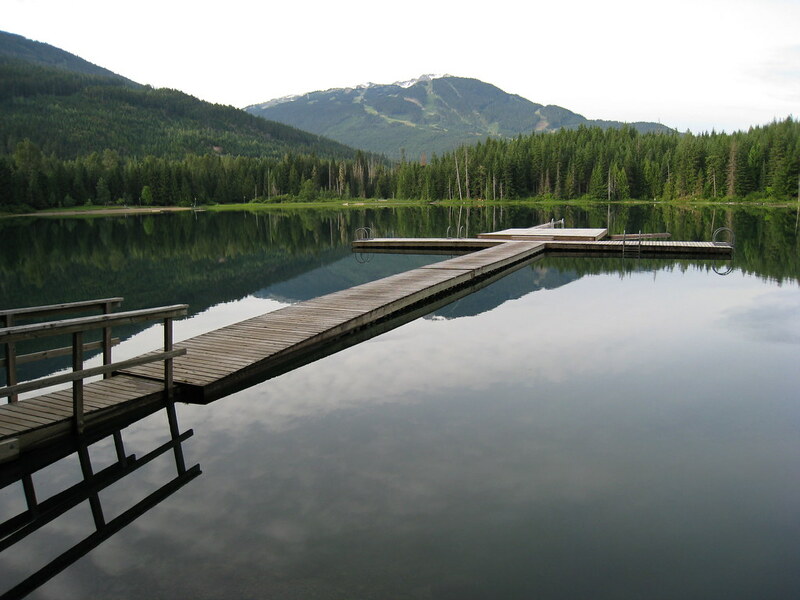 You can take in its million dollar views of both Whistler and Blackcomb from the far shores of Alta Lake. Originally developed as Rainbow Lodge in 1914 it has a cool mix of history and new amenities. 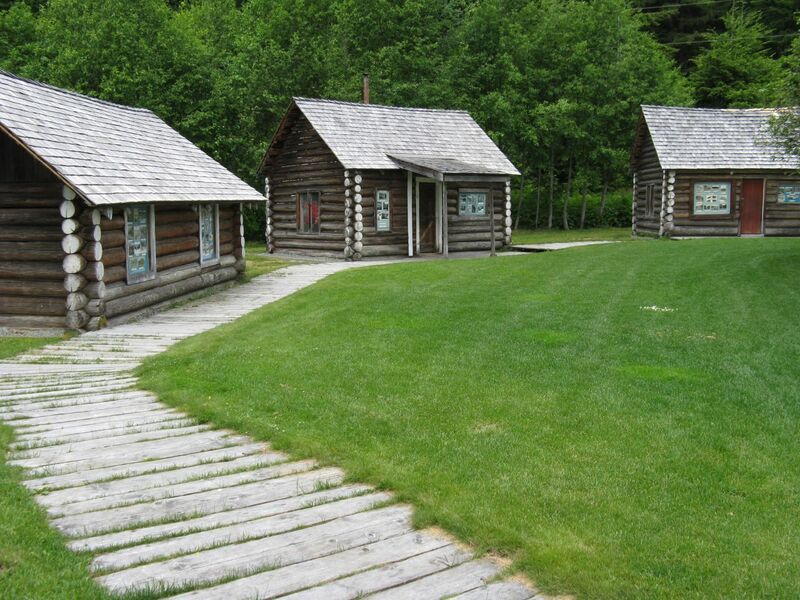 Take a walk around the park and you can find some of the original cabins. They have been converted into mini museums with tons of facts about the history of the area. Is comfort your thing? How does flush toilets, wheelchair access, and picnic shelters sound? Pretty sweet, I know. Rest assured you can grill in peace while the rest of the family is kept busy. They can go swimming, or start up a beach volleyball game on one of three sand courts. The sun-worshipers can swim out to one of the floating docks to bake. The only hard part is getting back in the water to come back. Getting to Rainbow Park is easy. 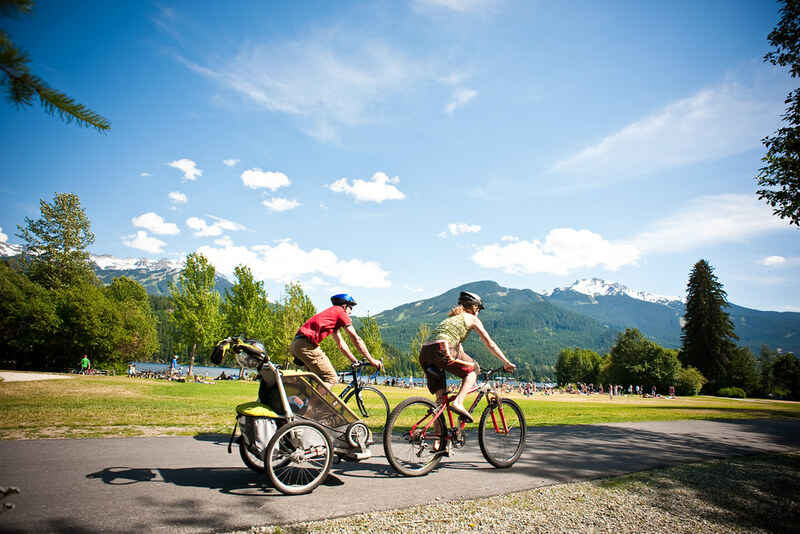 Saddle up for a quick 20 minute bike ride on the Valley Trail or you can drive and park on site.